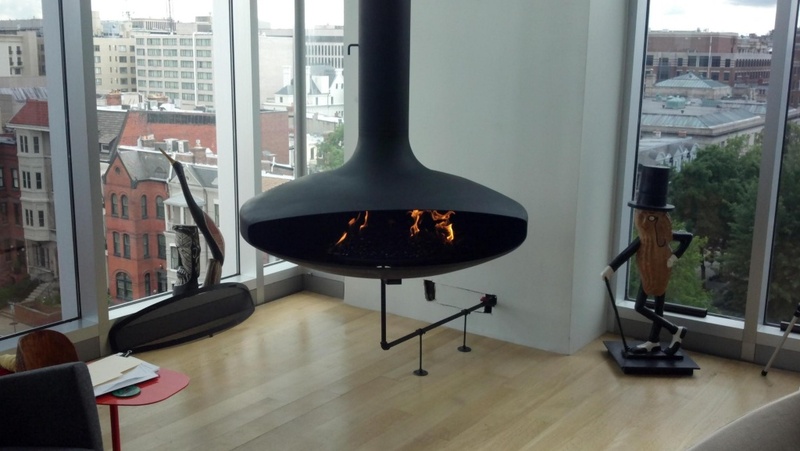 Gas burning inserts are the best option if you do not currently have a fireplace at all, as they are essentially the firebox and the logs all contained in one unit. This is the most expensive of the three options and is only recommended if you have no other option for gas logs. The firebox is the part of the fireplace where combustion of the wood or gas takes place and is often the first part of the system to be damaged since it is exposed to heat reaching temperatures up to 800 degrees. It is important to repair damaged bricks or mortar joints immediately to keep heat from damaging the chimney system or your home. If any of the bricks are loose or if the mortar joints are eroded our service technicians can tuck-point the damaged or missing mortar joints or rebuild your firebox with new fire bricks and high-temperature refractory mortar; thereby restoring the structural integrity of this important part of your fireplace system. The Solar Attic Fan is a simple and environmentally sensible solution that can save you money. Powered completely by free solar energy, this sleek and efficient vent is both compact and quiet. Fully operational right from the box, it installs easily, with no electrical wiring, no expensive electrician and city permits. And let’s not forget powerful! Operating at a whopping 850 cfm, a single solar attic fan unit can fully vent up to 1200 square feet. Place it wherever you need improved circulation; attics, lofts, workshops, storage sheds, garages, even barns.Our attic fan is powered. Saves Money Silently…With The Sun! Our attic fan is powered by a low-voltage D.C. motor that virtually makes no noise. With the balanced fan blade assembly, whisper-quiet operation is guaranteed. The fan motor works slower during the early morning and late afternoon hours when the sun is lower in the sky. During the hottest part of the day, when ventilation is needed the most, the solar panel’s higher power output increases the speed and efficiency of the Fan-Attic to move up to 850 cubic feet per minute (CFM) of air which can effectively cool down up to 1,200 square feet of attic space. Reduce Cooling Costs By Up To 50 Percent! During the summer months, attic temperatures can soar to over 150 degrees Fahrenheit. This makes your home hotter inside and increases the energy consumed by cooling and air-conditioning equipment. A Fan-Attic ventilation system helps remove the heat before it reaches the interior of your home, and helps to reduce the workload on cooling and air-conditioning equipment by as much as 50 percent. This helps to make your home much more comfortable. Extends The Life of the Roofing Materials! Though asphalt shingles are designed to take the abuse of the sun for many years, they are subjected to greater temperatures when the roof decking is allowed to overheat, which is just what happens in an under ventilated attic. In the cooler months, moisture is the most serious concern. Even with the use of vapor barriers to keep moisture from entering the attic, there are air leaks around ceiling light fixtures and bathroom exhaust fans that allow unwanted moisture into the attic. Moisture condensing on the framing members and the inside of the roof deck can lead to the growth of mold, mildew and rot in the roof deck and framing. A good indicator of moisture problem is rusty roof nails sticking through the roof deck. In the summertime, a conventional electric attic fan can add $10-20 per month to your electric bill. Conventional fans must also be wired into your home by a licensed electrician which means electrical permits, inspections, and added expense. The Fan-Attic, on the other hand, has its own built-in power supply. Compare the cost of the Attic Fan to regular attic fans. You’ll see how the Fan-Attic pays for itself in no time. Tubular skylights provide beautiful lighting that reduces your need for electric lighting. Tubular skylights use the sun for lighting interiors without the drawbacks associated with regular skylights and they resemble conventional lighting fixtures. Our tubular skylights have a roof-mounted light collector consisting of a high-impact acrylic lens set in a metal frame. They have a reflective sun scoop in the rooftop assembly that directs sunlight into a metal tube with a highly reflective interior coating. The reflective tube guides the sunlight to a diffuser lens mounted on the interior ceiling surface that spreads light evenly throughout the room. The shape of the scoop is parabolic to reflect sunlight into the home regardless of the sun’s angle in the sky. Do you need light at night? We also have a model that has integrated electrical lights so the fixture can provide light both day and night. This model works very well in bathroom applications where space is limited and multiple fixtures make the ceiling look too cluttered. Why Tubular Skylights Instead of Traditional Skylights? Tubular Skylights are far more energy efficient, the cylindrical design minimizes the area for direct light to enter and heat up the area, the thin light pipe radiates any collected heat into the attic area. Since the light pipe acts as a sealed shaft, very little heat escapes up the light pipe, whereas a tremendous amount of heat rises up the large shaft of traditional skylights. Tubular Skylights scatter 100% of the natural light spectrum through the use of a diffuser, thereby eliminating the spot light effect common with the traditional system. Tubular Skylights scatter 100% of the natural light spectrum through the use of a diffuser, thereby eliminating the spot light effect common with the traditional system. 99% of harmful UV rays are absorbed by the tubular skylights special dome, light pipe and diffuser material, thereby eliminating the bleaching effect on rugs and furniture. 99% of harmful UV rays are absorbed by the tubular skylights special dome, light pipe and diffuser material, thereby eliminating the bleaching effect on rugs and furniture.